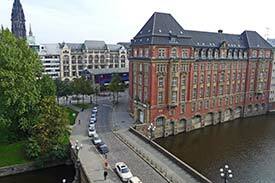 The Steigenberger hotel group's outpost in Hamburg has a great canalside location in the heart of town. Location. The Steigenberger Hotel Hamburg is on the Alsterfleet, one of two parallel canals that run between the Inner Alster lake and the Elbe. It's within walking distance of the main railroad station, sightseeing attractions in the city center, and downtown shopping zones like the Mönckebergstrasse, the Jungfernstieg, and the Alster Arcades. The hotel's immediate neighborhood is quiet, with a canal on the front side of the building and a pedestrian-friendly street with bars, restaurants, and shops behind. (Soundproof windows also keep noise out.) Just a few meters away, however, you can catch the S-Bahn at Stadthausbrücke or the U-Bahn at Rödingsmarkt. For access and convenience, the Steigenberger Hotel Hamburg is hard to beat. Creature comforts. The Steigenberger Hamburg Hotel has 221 rooms and 12 suites, with separate floors for smokers and nonsmokers and modern but comfortable furnishings. Even the cheapest "Standard Rooms" offer a choice of king-size, queen-size, or twin beds, plus large desks and chairs for sitting and reading. As a bonus, all rooms have waterway or city views (no parking lots or blank walls to look at). My suggestion: Book a room on one of the upper floors and use the glass-walled staircase to enjoy the changing view on your way down to breakfast. Food and drink. The buffet breakfast in the Restaurant am Fleet is pricey but up to the Steigenberger group's high standards, with enough food choices to keep you going until a late lunch or teatime. The Bistro am Fleet serves excellent lunches and dinners indoors, in the winter garden, or (in good weather) on a terrace. The hotel also has a gourmet restaurant, CALLA, and a piano bar (neither of which I've tried). Service. Steigenberger's staff are more efficient than fawning, but they're also friendly and helpful. I've never had a problem with check-in our check-out at a Steigenberger hotel, and my free morning newspaper at the Steigenberger Hotel Hamburg was either the Herald Tribune or the Financial Times, in deference to the language on my passport. Complaints: Only one--the lack of free Internet service (a common failing in upscale hotels, where the managers know that business guests will charge Wi-Fi or Ethernet fees to their expense accounts). In summary: If you can afford the rates, enjoy well-designed contemporary hotels, and don't mind paying for Internet access, you're likely to be satisfied with the Steigenberger Hotel Hamburg. For more information, or to reserve through our secure booking partner, click here.